Here’s a case that’s worth filing away for those who do probate litigation and estate administration. It’s unpublished, but addresses an issue that comes up not infrequently. The holding is that a probate court cannot deny a petition to appoint a personal representative on the grounds that the estate has no assets. Instead, the court concluded that the appointment of a personal representative was unnecessary because there were no assets in the estate to probate. In doing so, however, the probate court did not cite statutory authority that allows a court to deny the appointment of a nominated personal representative on those grounds. To the contrary, a court rule provides that personal representatives do not need to provide notice to creditors when “[t]he estate has no assets[. ]” MCR 5.208(D)(3)(a). It follows that personal representatives can be appointed even when the estate has no assets. There are many reasons to open an estate which have nothing to do with distribution of assets. This is a good decision, and although unpublished, should provide an outline for the argument when attorneys are faced with this misunderstanding in their cases. 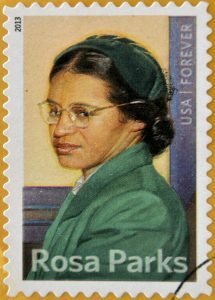 The Michigan Court of Appeals released what will presumably be the final statement on litigation involving the estate of Rosa Parks, the deceased civil rights icon who died a resident of Wayne County in 2005. Click here to read the unpublished opinion. The case is lengthy, and details much of the history of the litigation. In the end, it came down to a battle over her coat. Not just any coat, but the coat she wore on the day she made history by refusing to give up her seat on a bus to a white person in Montgomery, Alabama. The Readers Digest version is that Ms. Parks had no children. A Foundation offered a will which favored the Foundation. Ms. Parks’ heirs challenged the will, but settled the case by agreeing to a share of the proceeds from the sale of the historically significant items she possessed, as well as the licensing value of Ms. Parks’ likeness. As part of that agreement, one niece agreed to contribute the coat Ms. Parks wore on that fateful day in 1955 to the items to be sold. She never produced the coat and later claimed she did not know its whereabouts. Hence the litigation continued. If you lose in probate court, it’s not cool to reframe the case and file it in circuit court, no matter how much you don’t like the probate judge. The probate judge decided that the Foundation was entitled to an offset for the missing coat, and advised the Foundation to initiate an action to determine the coat’s value. The Foundation went and filed a civil action in circuit court for breach of the settlement agreement. The circuit court bounced it back to probate court. The COA agreed with the circuit and probate court that the gravamen of the case was the administration of the estate and properly in probate court. The Foundation got sanctioned for forum shopping. There are limits to when you can get a jury in probate court. Sanctions are equitable and damages are legal. The COA agreed that this case was about sanctions, therefore equitable, and therefore the probate court correctly denied the right to a jury. Some things are really hard to value, and if the party seeking to establish a value fails to do so, they can lose big time. This part of the case is probably the most troubling. The Foundation was essentially instructed to bring an action to establish the value of the missing coat so that the heirs could be appropriately sanctioned. The Foundation produced an 84 page appraisal which offered a variety of methods for valuing the coat, using comparables such as Jesse Owen’s gold medal and the dress Marilyn Monroe wore when she sang the birthday song to President Kennedy. The heirs offered no evidence. The trial court concluded that the appraisal was unconvincing, and that therefore, the Foundation had failed to meet its burden to establish a value, and therefore, that no sanction would be allowed. The COA affirmed that result too. Seems extreme. Perhaps the Foundation had reason to want to get to circuit court. And that’s how it ends. Worth a read perhaps only because of who it involves. In the combined cases of In Re Estate of Lujan and In Re Estate of Gulick (click on name to read opinion), the Court of Appeals upholds the trial court’s decision that a third-party contractor, Probate Asset Recovery LLC (“PAR”), is not entitled to a contingency fee for finding abandoned real properties (which have equity value) and for bringing that information to the attention of the Public Administrator. It’s a lengthy decision, and unpublished. Essentially, PAR claims it is doing a public service by finding homes that need probate administration and notifying the PA before the property goes into foreclosure. PAR argues that a 1/3 contingency of the equity in such properties is fair compensation because their business model requires them to investigate many homes that turn out to be not worth pursuing for every home that they find which justifies opening an estate. PAR says that if they can’t operate in this manner, they will go out of business and the solvent homes they now find will end up foreclosed, and Michigan families will lose out. The COA counters that: Only lawyers are authorized to get paid contingency fees, and your business model isn’t our problem. Rather the trial court’s job is to look at what the reasonable value of your services were with respect to the property of this estate. In these cases, the trial court determined that the reasonable value of your services was $45 per hour, and that decision is affirmed. For our purposes, the case would be helpful in situations in which a beneficiary is challenging the fees paid to a non-lawyer agent. In addition to affirming the rule that such arrangements need to be reasonable, this case provides support for the propositions that: (1) the trial court can directly reform contracts between the PR and the non-lawyer agent; and (2) in determining reasonableness of such arrangements, the trial court only concerns itself with the value provided to the estate and not the agent’s business model or public utility. Cottage in Grand Traverse County is held in revocable trust. Settlor dies in August 2014. Township uncaps property taxes for 2015 – which is the calendar year following the year in which ownership changed – so says Township assessor. Trustee objects claiming uncapping should not have occurred in 2015, because: (1) claims period for creditors had not expired until early 2015, and/or (2) the property was in fact not distributed from trust, and therefore no change of ownership occurred. COA rejects both arguments. Taxes go up 65%. To read Fifarek House Trust v Long Lake Township, click here. Uncapping issues are always interesting, and the best uncapping cases always seem to involve up north cottages. This case is unpublished, so consider that. Bad timing for the Fifarek family. The uncapping would have been avoided entirely had the settlor lived a few more months. A new statute preventing uncapping for transfers to family became effective December 2014. Settlor died in August 2014. To read more about our new-ish uncapping rules, click here. The case has implications for situations where real property in trust is not residential or trust beneficiaries are not family. The rule of this case is that a change of ownership occurs when the settlor dies, because that causes there to be new trust beneficiaries. I think the COA gets it right. Somewhat surprised that there is a dissent, endorsing the Trustee’s creative but tenuous arguments. Click here for dissent. It’s 1931 and Tough Guy (“TG”) impregnates Mom then dies shortly thereafter in a street fight over Mom’s affections. TG dies before his baby is born. TG’s baby grows up and has one child. That child (TG’s grandchild) dies many years later, leaving no will and no issue, no surviving parents or grandparents, but an estate of about $500,000 (enough to litigate). Because of a dearth of offspring, the issue is whether TG was a good enough parent to inherit under Michigan’s intestate laws. If he was good enough, TG’s son by another mother (who is a half uncle to the decedent) would inherit half the estate. The case is called In re Estate of Kenneth James Koehler. To read the case, click on the name. Michigan law includes provisions in MCL 700.2114, designed to punish absent and deadbeat parents. Essentially that law says that a sperm donor dad (or egg donor mother) who either doesn’t acknowledge their child or fails to support their child during that child’s minority is not treated as a parent for inheritance purposes. In this case, the Court says the exception wouldn’t apply to TG because he was never alive when his child was born, and therefore never had a chance to neglect his child financially or emotionally. So, half-uncle gets a windfall. This case comes about because of a law that seeks to punish bad parenting through the probate process. As with many well-meaning statutes, the devil is in the details. It feels right that a bad parent shouldn’t inherit from his/her child’s (or in this case, grandchild’s) estate. But seriously, if the story was different, say TG had been shipped off to war after impregnating his girlfriend and died a war hero, would anyone really be arguing that his side of the family wouldn’t be entitled to a share? And maybe more interesting, what if TG had lived for a couple months after his baby was born, and during that short time period ignored the child and provided no financial support, would that be enough to cut him out? What if TG didn’t die, and acted like a parent for one year but then disappeared for the next 17? The case is published – so it matters. Colleague Phil Harter sees this as a case in which bad facts are making bad law. He points out that the case deviates from the prior law with respect to proof issues. A link to Judge Harter’s analysis is click here.